I’m back with my annual sharing of my own Disney World planning tool. BIG change to this year’s data. As always, I’m using data from TouringPlans.com – a GREAT source for Disney planning, and they had an amazing year in 2013 and are even better now! And in 2013 a big change was the way they create level data. 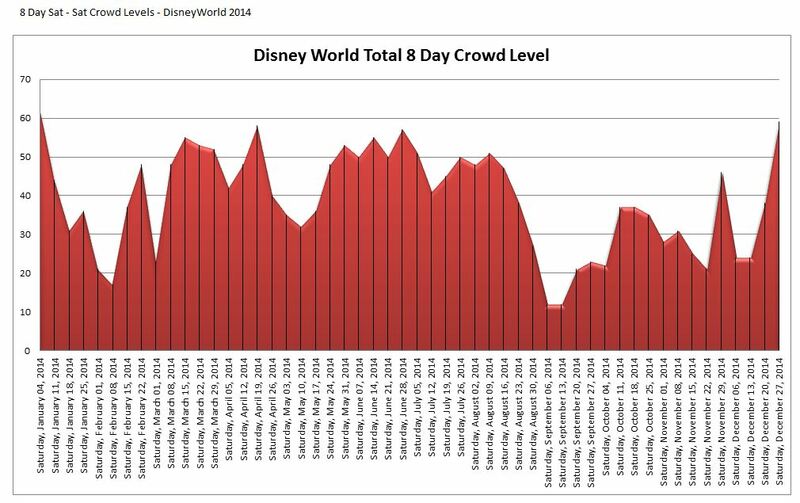 Previously they put all dates in order and the crowd level for each – the bottom 10% of that list were 1’s on the crowd calendar, next 10% 2’s, etc… up to the top 10 on the list of crowd levels at Disney World were 10’s on the crowd calendar. But they’ve improved on that. 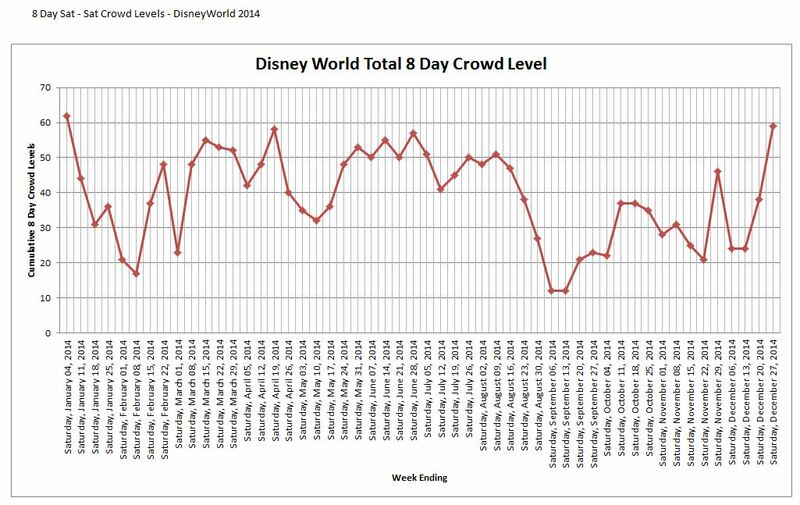 Disney World crowds simply don’t follow a perfect bell curve like that – there are a lot more 5,6,7 days than 1,2,9 and 10 days and the crowd calendar now reflects that MUCH better and overall the crowd calendar is better. Thus my charts are better and still show the peaks and valley’s of wait times at Disney World. And remember, the keyword there is wait times – not crowds, this is based entirely on wait times. Disney World is always crowded, it’s wait times that matter. Again I remind you that the single best bit of advice on short wait times at Disney World has NOTHING to do with all the data below. Avoiding long waits is relatively simple – ARRIVE EARLY! And I don’t mean 8:55 am if the park opens at 9:00 am – I mean AT LEAST 8:30 am for a 9 am opening. Even during Christmas week (the week between Christmas and New Year’s Day – BY FAR the busiest week at Disney World) you can ride everything you want at Magic Kingdom with very little waiting in line if you arrive 30-60 minutes before park opening. You’ll ride 7-9 rides with no more than a 5 minute wait before 11 am. By Noon the shortest wait in the park will be 30 minutes and only get higher most of the afternoon. If you aren’t an early riser your best bet is to ride rides during parades and fireworks in the evening and after as the crowds start to depart the park. So, arrive early, have a touring plan and you’ll wait in short lines. How important this step is will vary by time of year – if you visit during “low” times, so called non-busy times at Walt Disney World then you can get away with a later arrival and less of a plan. Of course , early arrival and good planning helps anytime of the year. On to the crowd calendars. The first image is for every week (Sat – Sat) in 2014, ending on Saturday. As always, September has the shortest wait times of the year, with early February and early December a close second. Back to Saturday – Saturday data – same as above, just a different chart style. In fact there are 2 versions of the same chart just formatted a bit differently so pick the one that suits your eye better – the data is the same on both. Again, this is Sat – Sat weeks for 2014 – of course not everyone travels Sat – Sat but in general this will give you a rough idea of expected wait times in general at Disney World.